Three of Heart Meaning: Lovers Triangle. Karmic Challenge for The 3 of Hearts: Loyalty and Faith in Love. All THREE's represent an element of uncertainty based on the meaning symbolized by their suit. The HEART suit represents love and relationships. Thus, even though the 3 of Heart appear to be charismatic, social butterflies, in truth, they are inherently mistrustful and unwilling to commit. Adventurous and entertaining, the creative energy is a keynote of all 3's. As well, a genuine curiosity about what makes other people tick is an endearing quality of the Three of Heart. The Soul Card for the 3♡ is none other than the A♡. This second heart emphasis attributes to their beautiful, emotional nature, and their compelling need for love. 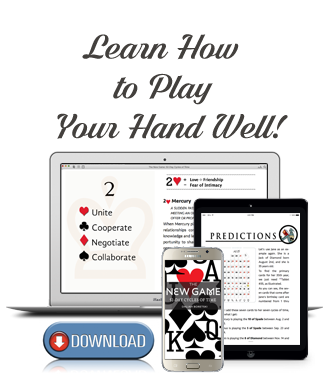 Highly capable of achieving success in any work involving groups of men or labor unions, the 3 of Heart are very quick to adapt and will change occupations whenever they feel stagnant or bored.